As a frequent renter of vacation homes (every year for the past 10 years), and a mom of two young kids, I've created my list of Top Ten Kid-Friendly Items for Your Vacation Home Rental. First let me say, I much prefer renting a house compared to staying in a hotel when on vacation. You get more room, a full kitchen, a driveway where the kids can ride bikes, play with chalk, or their scooter. The house is often equipped with a hose to wash off your beach chairs, little feet, and sand toys. There are no bright lights coming from hotel walkways shining in your baby's window, no loud neighbors in the adjacent room, no loud hotel hall-way conversations waking up your sleeping baby. I LOVE vacation homes! And so do my children! The homes that end up being the best, at least for us, are typically the ones that have extra amenities for kids; they are usually small touches but these small touches can really make a difference for the little ones, and therefore moms and dads. 1. Board Games - Yes, everyone says this. But, every once in a while, go through your boardgames to make sure directions are still included, all the pieces are still intact, not broken or missing. Tape the boxes if they are falling apart (or buy new ones, they're cheap enough). Have a variety for different ages, buy newer ones, buy ones that get really good reviews. Look on Amazon to see what the latest games are. 2. Movies for Kids - I've stayed at some houses that have a huge selection of movies, but they are usually a bit outdated, and the selection for the little ones is lame-o. Update your movie collection annually; you don't have so spend a ton. Buy them throughout the year when they are on sale. Write on the box "Do not remove from this house" and that will remind most guests who the movie belongs to! Or better yet, sign up for an online movie service; that way no one accidentally walks off with your movies. 3. Bunk Beds - Boy o boy, do the kiddies love the bunk beds. Often times my kids beg me to make sure I find a house that has a bunk bed. Usually we have to devise a schedule to make sure they all get their chance to sleep on the top! This next part is important: If you have a bunk bed, please please please have a working ladder or a bed with a ladder built in. Yes, I've seen kiddies fall from the top, and have bruises, cuts and fat lips for the remainder of their vacation. If possible, when shopping for your bunk bed, try to find one that is somewhat easy to change the sheets. It's hard for us "older people" to climb up there to make that upper bunk. 4. Kiddie Cups & Plates - My kids don't mean to break your glasses and plates, but it happens. A set of plastic cups and plates go a long way in not breaking any! 5. Broom and Dust Pan - See previous entry. Also helps with cleaning up sand. I will gladly do it if you provide me with the tools. 6. Night Lights - They are cheap, don't use much electricity, and really help out with kiddies in unfamiliar rooms when falling asleep and getting up in the middle of the night to use the bathroom. I can't tell you how many nightlights I've "donated" to my vacation rentals. I think I buy one on every vacation, and just leave it in a dresser drawer when I leave. 7. Room Darkening Shades - The rising sun is a beautiful sight! It's even better when my kiddies are not getting up with it. We usually end up using some of the covers and blankets to hang on the windows, just to push that wakeup time just a little longer. I know they are a little spendy - but well worth it when the little ones are not awake at 5 AM. 8. Sand Area - When mom and dad aren't quite ready to hike down to the beach for the day, an easily accessible sand area is a great place for the kiddies to play! 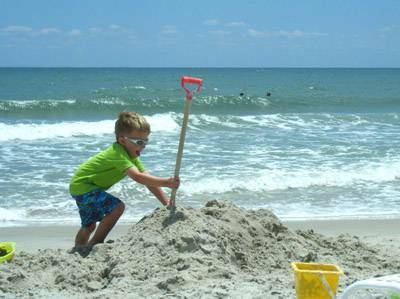 Load it up with some sand toys, and the kids might be entertained for hours! 9. Pool Toys - What kid doesn't love a cool raft, fun little things to dive for, and pool games. Yea, you might have to replace annually, but like I said, it's the small things that make for a great time! 10. Extra Towel Rods & Hooks in the Bathrooms - Usually there is one, maybe two towel rods, but having a few more places to hang wet clothes goes a long away in letting little bathing suits and bath towels drip dry before the next days adventures. Over the bathtub would be ideal! Low enough for little hands to reach would be top-notch! Our next beach rental vacation is planned for Duck, NC. Can't wait! Netflix is an alternate to having a DVD collection. It has a cheap monthly rate. Beach umbrella for the kids to play under. We have turned the hall closet in our Florida beach condo into a "Beach Closet" where everything you can use at the beach and/or the pool is stored: Beach Towels, Beach Chairs, Beach Umbrellas, Sand Pails and Toys, Cooler, Beach Shade Tent, and Pool Noodles. We find that almost every guest contributes something new that they buy and don't want to take back home on an airplane! We have wireless internet and are considering a streaming box, then guests could use their own Netflix account to order movies to be streamed to the tv. We have one at home and couldn't live without it! A Roku box costs less than $50. One more thing: We find low cost DVD's at pawn shops...the one near our property sells regular DVDs for $1.99 and Blue Ray for $3.99! The board games are low cost at thrift stores...but you need to check for all the parts before buying.